Computationally Thinking: Was the Twitter Plunge Caused by an Algorithm Reading Twitter? Was the Twitter Plunge Caused by an Algorithm Reading Twitter? Last week the Associated Press twitter account was taken over and a fake tweet about explosions in the White House was sent out before the account was recovered. 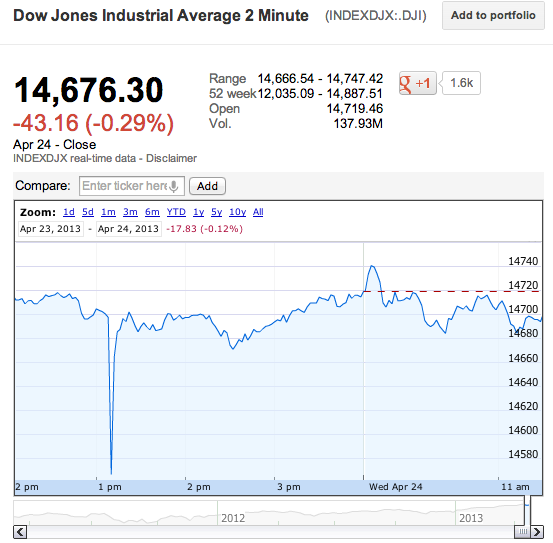 This caused a very brief dip of around 1% of the entire Dow Jones. 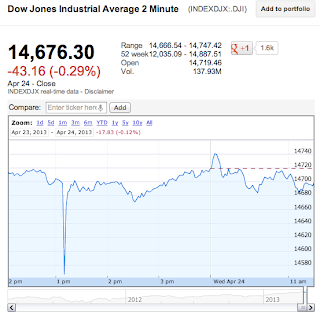 Some now think that this blip was caused, or at least exaggerated, by high frequency, algorithmic trading. The use of intelligent algorithms to scan trends in the stock market and automatically make trades has been going on for years. But as Artificial Intelligence advances so does how it is used in automated trading. Hedge funds and others use a lot of machine learning algorithms and text analysis to guess at what people are thinking and whether a stock is going to go up or down. Anyone with the words "Machine Learning" on their website probably regularly gets emails from unnamed "Investment Firms on Wall Street" wanting to talk about working on some new trading system that they are certain will make you rich. As the article points out, it would be kind of surprising for a lot of humans, managing a lot of money, to quickly sell huge amounts of stocks based on one tweet which isn't corroborated anywhere else. At least, you'd hope that would be surprising. So it could be that this was a case of an algorithm doing automated analysis of Twitter and with the authority to act on it's understanding of trends. There is a lot of potential for using automated text analysis and machine learning to have machines read the internet and form theories about which way the stock market is going to move next. This is an exciting challenge for Artificial Intelligence research. But most human beings have a lot of trouble inferring any kind of meaningful trends from what "twitter is saying". Twitter is one of the most wonderfully cacophonous, layered and conflicting non-stop discussion on the whole internet. It is probably the most difficult dataset you could choose to point your algorithm at in order to gain meaningful information. Using this information to make decisions and immediately act on them is even more risky. For the good of the markets, and for the good name of AI and 'Algorithms' in general. I hope those running these trading systems decrease the weight they give to Twitter in the future. Or better yet, remove Twitter entirely except as perhaps an early warning alert system. Then let it slow down for a just a minute, get a human's attention, and make sure it's the right call. You'll probably only lose a few million even if the algorithm was right. But if it was wrong, you'll save us all a lot of stress.